Reiki is a natural healing method and it is very easy to learn Reiki. Anyone with a sincere desire to learn can come for our weekend Reiki courses that we have been conducting since more than a decade and walk out with your natural healing abilities activated for a lifetime. We are thankful to God to give us this opportunity to bring peace and balance in the life of so many people all over Mumbai, Thane and Navi Mumbai. Reiki top 10 benefits are experienced by almost everyone who learns Reiki. We conduct Reiki Courses for Level 1 and 2 every alternate Sunday. During weekdays usually we are available for students who would like to arrange a Reiki course at home. I have conducted several individual Reiki courses in South Mumbai. At the end of the class students get your Certificate, Manual, Reiki Attunement and and life time guidance and support. The Reiki level 1 course will be conducted on Saturdays. There will be a Reiki level 2 course or Reiki level 3 course on Sunday morning for students who have completed Reiki Level 1 course. 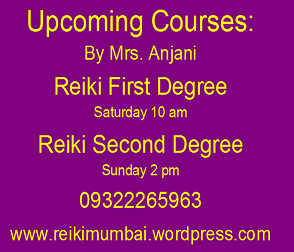 The classes will be taught by Reiki Grand Master Mrs Anjani and Mr Sudhir Damania. The classes are always relaxing, informative and include lots of individual attention. You can share your goals freely and take personal guidance for your healing sessions. 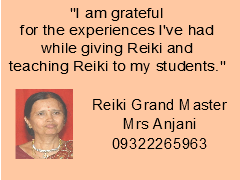 Mrs Anjani has provided traditional Usui Reiki classes and attunements to hundreds of students in and around Mumbai. Reiki First Degree is about touch healing and healing at physical level. Reiki Second Degree is about distance healing and healing at mental and emotional level. 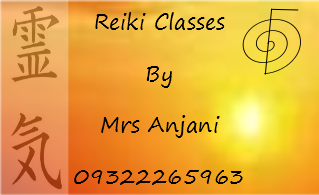 Mrs Anjani offers private Reiki instruction to individuals, couples, groups (friends and family members) and Companies and open workshops for where people from different walks of life participate. Mrs Anjani to customizes all the session to suit the specific needs, wants and goals of the audience.